3.25" x 5" Thermal transfer paper 7.5mil tag. Side Sensing Notch. 1,030 labels/roll, single roll. Also available as a case (Part# 65156). 3.25" x 5" Thermal transfer paper 7.5mil tag. Side Sensing Notch. 1,030 labels/roll, 6 roll case. Also available as a roll (Part# 65156-R). 3" x 1.25" Thermal transfer paper 7.5mil tag. Side Sensing Notch, Perforated, Left-Centered Hole. 3,750 labels/roll, single roll. Also available as a case (Part# 67251). 3" x 1.25" Thermal transfer paper 7.5mil tag. Side Sensing Notch, Perforated, Left-Centered Hole. 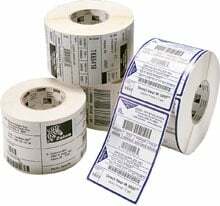 3,750 labels/roll, 6 roll case. 3.25" x 7.375" Thermal transfer paper 9.5mil tag. 2 Holes, Air-eject. 490 labels/roll, single roll. Custom item. Please call for pricing. 3.25" x 7.38" Thermal transfer paper 7.5mil tag. Compatible with Industrial printers. Fanfolded, Side Sensing Notch, Perforated. 860 labels/roll. 4 roll case.